Many destinations are benefiting from their connection, however tenuous, to a popular work of literature. Despite being dead since 1817, Jane Austen remains one of the most popular writers in the English language. Her works of quiet social satire have inspired countless film adaptations and modernizations, reams of fan fiction (both of the published and of the online variety), and even a weeklong festival in Bath, England, the scene of many an Austen book. 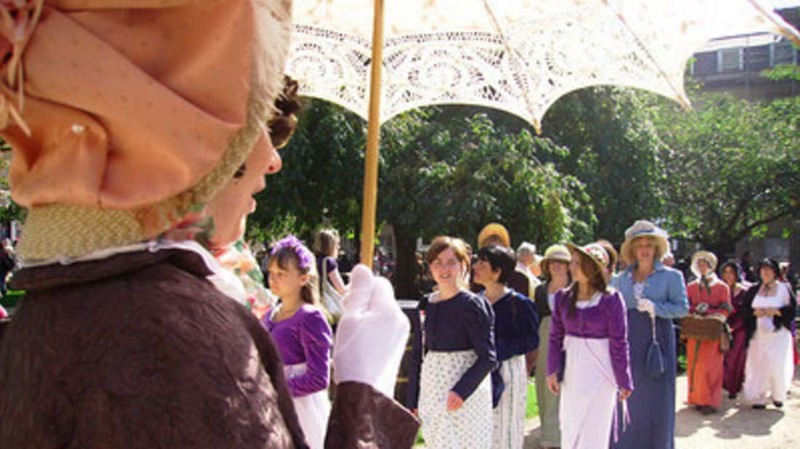 Thousands of Austenophiles spend a week in September dressing up as their favorite character from Persuasion, Pride and Prejudice or any of Austen's other works, engaging in Regency era gossip, partaking in country dances, a wedding, and touring the Pump Room. Prince Edward Island was the idyllic island home of everyone's favorite plucky, if melodramatic, red-haired orphan, Anne Shirley, better known as Anne of Green Gables, as well as, for a time, her creator, Lucy Maude Montgomery. The Anne of Green Gables books remain some of the most popular children's books, selling, over the course of the series century-long life, 50 million copies in 36 different languages. The 120-mile island still retains much of the pastoral countryside that Montgomery would recognize and is home to a year-round population of only around 135,000. The island has embraced Anne of Green Gables as, if not exactly its raison d'etre, then at least a good part of the reason why some folks visit. For the past four decades, Anne of Green Gables the musical has run every year at the Charlottetown Festival, while the sequel, Anne & Gilbert, began in 2005 and has run every year since. Interestingly, the term "Anne of Green Gables" is a registered trademark owned jointly by the heirs of Montgomery and the Province of Prince Edward Island. Ever since Harry Potter took over the world, King's Cross Station hasn't been the same—the fabled depot for the Hogwarts Express really does have a Platform 9 3/4. The mythic platform is tucked away in a passageway between two other platforms, sports half of a rather forlorn luggage trolley sticking out of the wall, and is routinely visited by Muggles with cameras (see photo, yep, that's me). But that's not the only stop on the Harry Potter tour: This past summer, a tourism company devoted solely to Harry Potter put together a five-day "School of Wizardry" in the Chicago area, involving classes in Divination and Astronomy, a Hogwarts banquet, and even a field trip to Chicago for Harry Potter: The Exhibition at the Museum of Science and Industry. British tour companies of all stripes have Harry Potter inspired tours through England and Scotland, though it is difficult to parse out book tourism versus movie tourism, since the two very much tend to overlap. If you want to make your own Harry Potter tour, then check out In Search of Harry Potter by Steve Vander Ark. I can't vouch for its quality, but it seems promising and the folks who bought it, according to Amazon, enjoyed it. The Louvre, for one, still offers a Da Vinci Code-based tour, beginning under the famous I.M. Pei pyramid. Once the site of Henry David Thoreau's misanthropic experiment, Walden Pond—a state park—is a perfectly clear 102-foot deep glacial pond open for swimming. Only 1,000 visitors are allowed in at a time, so while it's not exactly the isolated spot it once was, it's still pretty quiet. Thoreau only lived at Walden for two years, in a tiny, single-room shack barely large enough for a small bed, a desk, and a chair; in the 155 years since the publication of the book, however, hundreds of thousands of Thoreau pilgrims have visited the site in the hopes of earning the quiet contemplation and spiritual connectedness that Thoreau seemed to have achieved. Once they got there, however, they may have been disappointed: As Thoreau's place in the literary canon became sacrosanct, more and more people packed into the little pond. During the summer of 1952, crowds averaged 35,000 people, who brought with them their cars, hot dog stands, and litter. This prompted Massachusetts to make the site a "reservation" and put strict limits on the number of visitors, allowing the area to revert to a more natural state. More books, papers and articles have been written about Southern writer William Faulkner than any other writer in the English language, excepting, of course Shakespeare. So it stands to reason that there be some tangible monument to his work, a place where Faulkner fans can go to wonder at his genius and study his life. In 1972, they got that place after his daughter sold their family home, Rowan Oak, where Faulkner spent some of his most productive years, to the University of Mississippi. The home, a Greek Revival edifice that pre-dates (and survived) the Civil War, is visited by thousands each year. Barnhill was George Orwell's misty Scottish retreat, far from the city and civilization, where ironically enough, he wrote the claustrophobic classic 1984. Orwell, whose real name was Eric Arthur Blair, used the income from his other classic, Animal Farm, to rent a cottage on the small, isolated isle of Jura off the coast of Scotland. It was there, afflicted by the tuberculosis that would eventually kill him, that he finished the book. 1984 is still a staple of the high school lit course and in 2009, Queen Elizabeth II made headlines when she presented the visiting president of Mexico with a copy of the dystopian masterpiece, prompting the news media to wonder exactly what she meant by that. In any case, if reading 1984 wasn't depressing enough, you can immerse yourself in the Orwellian milieu by renting Barnhill for a week—only 8 miles from the nearest telephone and 25 from the nearest pub, the cottage is going for about $780 a week. Provided you can get there, of course. Ernest Hemingway's Key West home, where he lived from 1931 to 1939 and wrote A Farewell to Arms, is now overrun with polydactyl felines, supposedly the descendants of cats originally owned by Hemingway (a claim refuted by his surviving family). Cats aside, Hemingway did live and write there, did reclaim a urinal from Sloppy Joe's and turn it into a water fountain, and did set up a boxing ring in the front yard. The place is also home to the first swimming pool in Key West, installed by Hemingway's second wife, Pauline. But truly, the main attraction at this National Historic Landmark is the cats—it's like crazy cat lady colony heaven. There are about 60 cats living at the house, and many of them have either six or seven toes on each foot. They sport names like Spencer Tracy, Archibald MacLeish, Simone de Beauvoir, Emily Dickinson, and Gertrude Stein. Despite the fact that Anne Rice has turned her back on vampire lit and instead embraced recreations of the life of Jesus, tourism to the Gothic underside of the city of bourbon, blood and lust blew up after her Vampir Lestat novels hit the bestseller list. New Orleans, with its deep vein of voodoo and Santeria and dark history of slavery and war, took to the influx of vampire tourists with aplomb, even spreading rumors that "vampires" were loose on the streets, slashing the unsuspecting and drinking their blood. In the 1990s, at the height of her fame, Rice herself organized tours of the city, which then included stops at her first home, at St. Elizabeth's Orphanage (a 93-room former orphanage that Rice bought and renovated) and Lafayette Cemetery. While Rice has left New Orleans for a gated subdivision out in the suburbs, a number of tours still exist that take their inspiration from Rice's books, with stops at the historic Gallier House, the inspiration for Louis and Lestat's house in Interview with a Vampire, various other Garden District homes, and of course, the cemeteries. You can get most of your literary tourism out of the way —and some of your musical and modern art tourism, too—with a single, mind-boggling trip to the Hotel Chelsea. For decades, the hotel enjoyed a storied reputation as the haunt of drug addicts, alcoholics, writers, and sometimes all three: Charles Bukowski, Thomas Wolfe, Dylan Thomas, Tennessee Williams, Mark Twain, Allen Ginsberg, O. Henry, Jean-Paul Satre and others have all written from there, drank there, argued there, or even died there. Jack Kerouac wrote On the Road there, Charles Jackson of The Lost Weekend committed suicide there, and Sid Vicious woke up to find his girlfriend, Nancy Spungen, dead from a stab wound to the stomach there. Oxford is a Mecca for fantasy fans of all stripes: This college town was the home of J.R.R. Tolkien, C.S. Lewis, Charles Dodgson (better known as Lewis Carroll), and more recently, Phillip Pullman, author of the His Dark Materials books. While Oxford's amazing architecture and hushed historical tones are enough of a tourist draw, fantasy fans who want to see where it all began can check out the Museum of Oxford, which is home to several personal artifacts of the real Alice, Alice Liddell; stop for a pint at the Eagle and Child pub, where Tolkien, Lewis, and other members of the Inklings, would sit, talk, and debate theology; visit the place where he wrote The Hobbit and the first two Lord of the Rings books at 20 Northmoor Rd. or leave flowers at Tolkien's grave at the Wolvercote Cemetery; and tour Exeter College, Pullman's alma mater that was transfigured into the Jordan College of the His Dark Materials books. The Margaret Mitchell House in Atlanta is the three-story Tudor Revival apartment building in Mitchell herself wrote the seminal Southern apologist epic, Gone With The Wind; the whole thing is now a museum dedicated to the author and Southern history, one of Atlanta's most popular tourist attractions. Mitchell and her husband moved into apartment 1 of the building in 1925; she began writing the Pulitzer Prize-winning book soon after. Gone With the Wind, published in 1936, was immediately a tremendous success and turned into the blockbuster classic film three years later. Mitchell never wrote another novel, although she was for the next few years a very popular figure in Atlanta society; in 1949, however, she was killed by an off-duty cab while she was crossing the street. This entry isn't exactly about a place offering literary tourism now, and it isn't exactly about a place that offered literary tourism then—it's more about the power of fans and the books they love. When it was published in 1894, Trilby was hugely popular in America. The book, about a young half-French, half-Irish woman named Trilby O'Ferrall who, whilst under the spell of a hypnotist Svengali, transforms from a tone-deaf grisette into famous diva. The Gothic horror romance novel, written by George Du Maurier, whose granddaughter Daphne Du Maurier would practically reinvent the genre with Rebecca, inspired a rabid fandom along the lines of Twilight: Women donned striped skirts like the heroine and harbored romantic notions of the Parisian bohemian lifestyle in the 1850s; families named their pet turkeys after Trilby; people hosted "Trilby" teas and parties; the word "Svengali" became a byword for a person possessing an evil kind of charisma and able to control others around him; and whole towns transformed themselves into a paean to the book. Well, one town. Trilby, Fla., a tiny collection of storefronts and houses due west of Orlando. At the time, the place was called Macon, but residents of the town soon realized that people and letters directed for Macon, Fla., were being misdirected to the larger and better known Macon, Ga. Not long after the book was published, the president of the railroad line that promised to invigorate the little town decided change its name to Trilby and to name the streets after characters in the book. For awhile, the name change seemed to stimulate interest in the town, if not exactly tourism—riders on the train while passing through would crane their necks out the windows to catch sight of "Svengali Square" and "The Laird Lane. " Sadly, in 1925, a fire destroyed much of the budding township and its potential future as a Trilby tourist trap; by that time, however, some of the charm of being named after a book whose popularity was waning was wearing off. There are hundreds of thousands of places made famous by their relationships with popular books; what are some of the more weird and out of the way ones that you know of? Any favorites?